While your oven is preheating to 350 degrees, mash the three bananas until relatively smooth. Mix bananas, egg, and white sugar together until ingredients are combined well. In a separate bowl stir flour, baking soda, and baking flour. Add the flour mixture to the banana/egg/sugar mixture and stir until combined. Add vegetable oil and stir together. Finally, stir in chocolate chips. 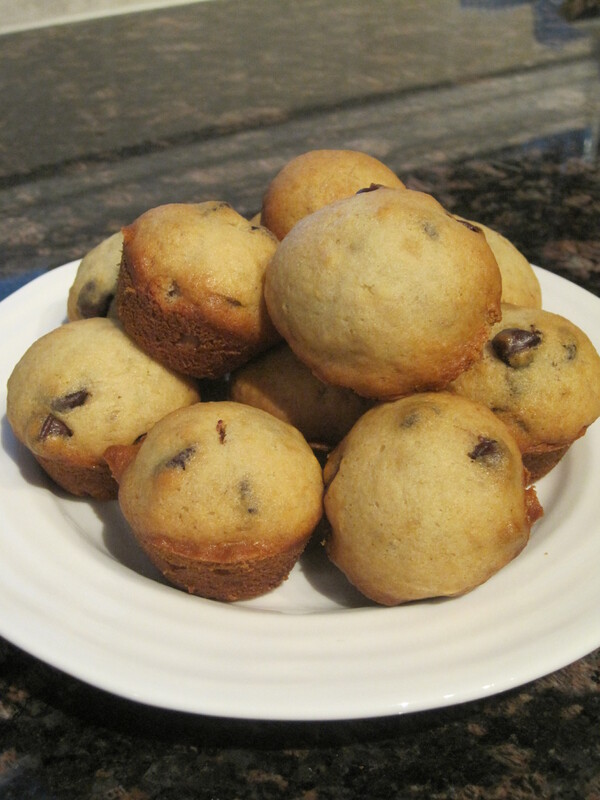 I usually make these muffins in a mini-muffin tin (makes 36) however if you prefer regular size muffins this recipe will make 6. Pour your ingredients into either a lined muffin tin or one with cooking spray. With a regular size tin, cook for 20 min or until muffins are golden brown. If you are using a mini muffin tin they should be done in about 12-14 min.